Because Damon and Stefan offer themselves to Cade as replacements for Seline and Sybil. Freeing the sirens and saving the children. 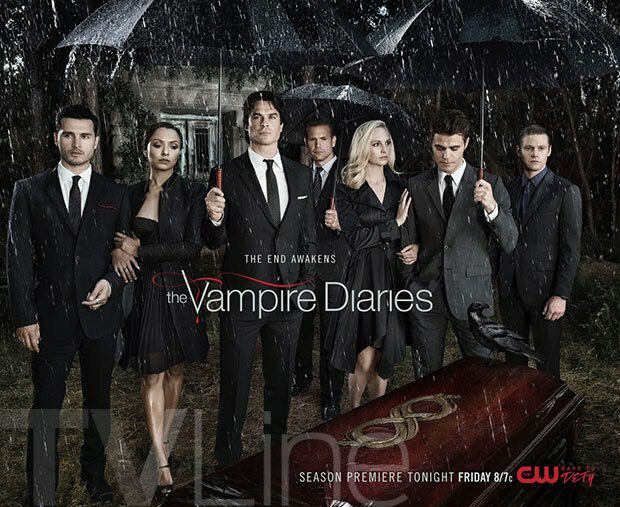 They’re willing – Damon will do anything to avoid hell and Stefan loves to be a noble sacrifice for the kids – and powerful old vampires are more of a prize than siphoner babies anyway. Sorry Alaric we need a reality check here. Now I’d be the first to say all the humans in this series really really need to get away from the vampires who randomly kill people for funsies. But they need to get the girls away from vampires to keep them safe? Seriously? There are two times to the best of my memory when these kids have been under threat. Firstly when they were in the womb and Jo was killed by her evil brother – who killed her because she was a witch and he was a witch and the twins were witches and ultimately no-one cared about vampireness. And now, when the siren Seline targeted them for being siphoners. Again, the presence or otherwise of vampires is irrelevant to this. These children have never ever been targeted because of vamprieness. In fact, since siphoning is both a) an excellent weapon against vampires and b) something the witches consider to be utterly horrendously awful, vampires are highly unlikely to be an issue but would make useful allies. The whole “you need to get the kids away from the vampires who love them, care for them and will fight for them” to keep them safe makes no sense.